Today, there is another addition to the PowerApps Office Template Series: Onboarding Tasks. Setting up a powerful, versatile, and useful onboarding experience can be one of the most challenging scenarios an admin or team leader will encounter. 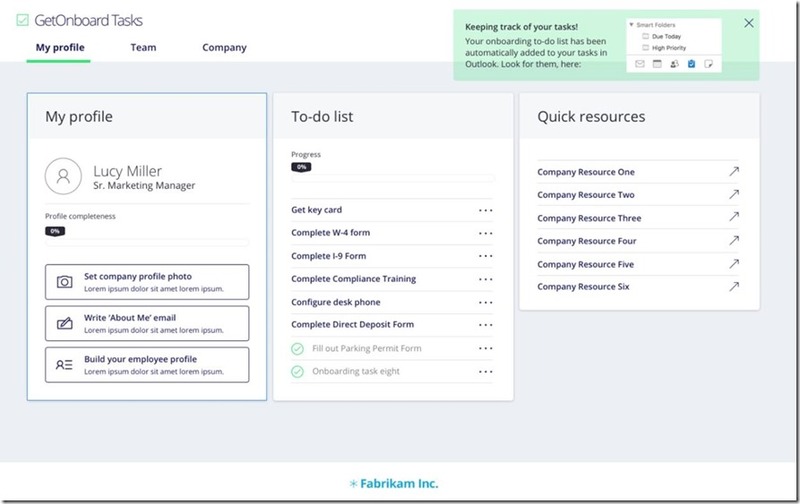 The Onboarding Tasks app serves as a template starting point for those people looking to quickly streamline their team’s onboarding experience. It acts as a one stop shop for new team members to introduce themselves, fill out their Office 365 User profile and photo, track relevant onboarding tasks, and much more. This app utilizes PowerApps connectors that use Microsoft Graph API operations. The Office 365 Outlook connector, Outlook Tasks connector and Office 365 Users connector are all used in this PowerApp template. For PowerApp makers, this means customization with the ability to leverage these productivity scenarios as inspiration for your own apps. 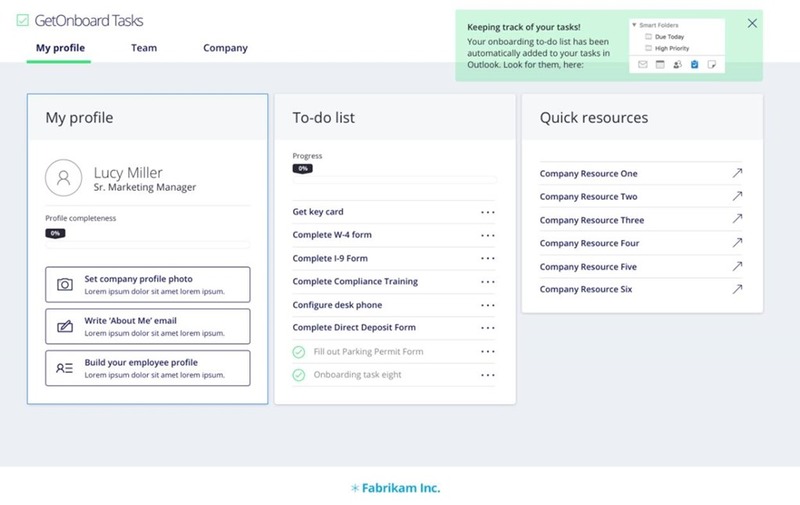 Try out the “Onboarding Tasks” powerapp and get your new team members up to speed quickly. Go to the Powerapps home (here), Clicking on the Office tab or search for “Onboarding Tasks”, and click the “Make this app button” on the tile. Check out a demo and setup instructions in this video. Everyone who has been new to the team knows that there are a lot of questions figuring out what needs to be done when you start. Built into the app are several admin-only screens which allow app makers to tailor the app to best suit their team’s onboarding experience. If you are the editor of the app for your team, you will see these extra screens in the list. They cannot be seen by the people just using the app. Use the first screen to add yourself to the table to allow you edit permissions to have buttons appear to allow you to add tasks, resources and edit company information. One of the most exciting things about the Office Template series is that as we release new apps, more Graph operations are becoming available in the PowerApps connectors. Our first two apps in the series, Out of Office & Shout-outs brought you the RelevantPeople endpoint which allowed you to retrieve your most relevant contacts. The “Onboarding Tasks” app brings you several new ways to bring your Office365 data to your apps. Through the Users connector, app makers/consumers can now edit certain pieces of information in their Office 365 User Profile, and even change their Office 365 Profile Picture. Not to mention being able to see information about other users in your organization. Take a peek at the team page for a good overview of your team members.